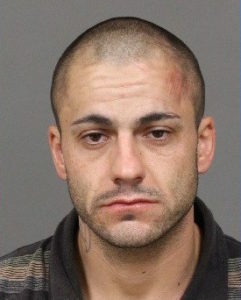 After fa suspect evaded capture and ran up a hillside, authorities used a thermal imaging device to spot a suspect hiding inside the attic of an Atascadero home. The man had led police on a wild chase in which he nearly ran over two officers and drove on train tracks in a stolen vehicle that was pulling a stolen trailer. Shortly before 4 p.m. on Dec. 1, Atascadero police officers responded to reports of a verbal argument between Dale Burr, 28, an another person. Officers then discovered Burr had felony and misdemeanor arrest warrants. When officers arrived at the scene, Burr began backing down a driveway in a vehicle with a trailer attached. The officers ordered Burr to stop. Burr did not stop, and he nearly ran over a motorcycle officer, as well as an officer who was standing at the scene, according to a police department press release. A pursuit ensued with Burr fleeing northbound on the train tracks. Burr crashed into a fence under the Highway 41 bridge and then fled by foot across Highway 41 and up Pine Mountain. Atascadero officers and San Luis Obispo County Sheriff’s deputies searched the area using K9s but did not manage to locate Burr. Investigators later determined that both the vehicle and the trailer had been reported stolen. The following day, police received information that Burr was at a home in Atascadero. Officers and detectives responded to the location, along with a sheriff’s K9. Police found Burr hiding in the attic after Atascadero firefighters used a handheld thermal imaging device, known as FLIR, to see through drywall. Officers arrested Burr and booked him in San Luis Obispo County Jail. Police charged Burr with evading a peace officer in a motor vehicle, grand theft of an automobile, possession of a stolen trailer, resisting a peace officer, having a felony warrant, having a misdemeanor warrant and two counts of assault with a deadly weapon on a peace officer. Burr remains in custody with his bail set at $70,000. Something I wouldn’t want tucked away in my attic. Did thermal imaging work because it was a hot pursuit? The story here is that there were multiple cops on the scene initially and multiple cops and deputies on the chase and this one loser evaded all of them. It doesn’t say much for the athleticism of today’s cops. They were lucky he didn’t do any more damage or hurt anyone overnight. Pure luck. That police dog needs to go back to school for tracking.The suspect ran on foot and the police knew where the foot pursuit started and the dog could not find them? Something does not make sense here did the police set up a perimeter, did the dog get brought in shortly after the guy fled? Those are a lot of charges! Sounds like the real life version of a Grand Theft Auto game.